Reference number for this case: 11-oct-54-Bauquay. Thank you for including this reference number in any correspondence with me regarding this case. 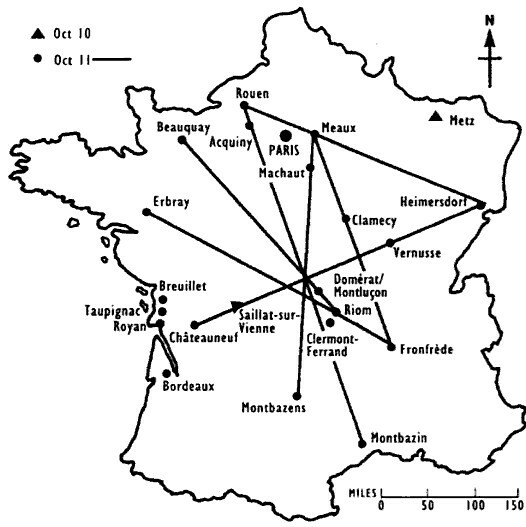 On October 13 and 14, 1954, numerous newspapers reported a case that reportedly took place on October 11, 1954, in Bauquay, in the Calvados department. Aimé Michel who quotes these newspapers indicates in 1958 that at daybreak a peasant of the village was in his meadow milking a cow, when a strange red light lit the countryside. Amongst three witnesses, this amazed peasant soon saw a large, blurry reddish shape at low altitude; which crossed the sky at a certain speed but not at a very fast speed. The shadows of the hedges turned according to the light of the craft moving overhead. The silence was complete. Michel adds that the witnesses later said that the object was at the altitude of the treetops. The cows were panicked and ran in all directions, including the one the farmer was milking. After the object was gone, the pragmatic farmer decided that his job had to be done anyway, and wanted to resume milking the cow, but the animal did not release any milk. Other peasants tried to milk the animal, to no avail. It was only the next day that the cow finally agreed to deliver her milk. In his computerized catalog, Jacques Vallée noted the hour of this sighting as 04:15. Later, British ufologist Gordon Creighton added that when the object passed, the terrified cows in the various fields around scattered in all directions, their bells tinkling wildly. French ufologists Michel Figuet and Jean-Louis Ruchon add in 1979 that the cows were trembling of all their limbs. Aimé Michel notes that the case is mentioned in the newspapers Le Figaro, L'Aurore, Le Parisien Libéré for October the 13th and 14th, and in Sud-Ouest and Ouest-France for October 14. He notes that it is "one of the most curious and most naive observations" of the season, and that it is aligned on other observations. He says that at daybreak of October 11, 1954, a peasant of the village of Bauquay was in his meadow milking a cow, when a stranger red glow came onto the country. Among three witnesses, the amazed peasant soon saw a large reddish glowing imprecise shape at low altitude, which crossed the sky at a certain speed but not a tremendous speed. The shadows of the hedges rotated along with the progress of the luminous object in the air. The silence was total. Michel adds that witnesses later said that the object was at the altitude of the treetops. The cows went crazy and run around in panic, including the one the peasant was milking. After the object was gone, the pragmatic peasant thought that his work had to be done no matter what, and wanted to resume milking the cow. But the animal produced no milk. To other peasants tried to milk the animal, to no avail. It is only the next day that the cow finally accepted to deliver. Oct. 11, 1954, dawn, Bauquay (France). A large red object was seen flying very fast at treetop level while cattle panicked. Three witnesses. 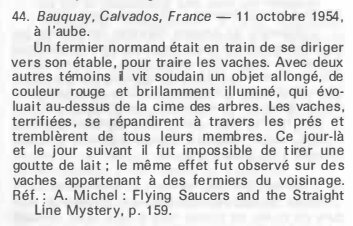 The author indicates that on October 11, 1954, close to Beauquay [Bauquay] in the Calvados, a large red object was seen flying very quickly at the level of the top of the trees, while the cattle, in panic, fled in the pastures. There were three witnesses. A Normandy farmer was on his way across the fields to milk his cow. With two other witnesses, he watched a huge red elongated object, brightly illuminated, sweep towards them at tree-top height. The terrified cows in the various fields around scattered in all directions, their bells jangling wildly. When the UFO had vanished and the farmer had caught his cow, neither he nor the other farmers could coax a drop of milk out of her, and she gave none until the morning of the following day. While the imagination of humans can play a role in the reactions caused by EM effects, this is unthinkable when it comes to animals. These "witnesses" are indeed unable to lie or imagine. In many reports, the human observer was warned of the arrival of a UFO before it was visible, by his dog or by other animals. - On October 11, 1954 in Bauquay (France), the cattle was in full panic. When 3 witnesses raised their eyes they saw a UFO flying over them. 44. Bauquay, Calvados, France - October 11, 1954, at dawn. A Normandy farmer was heading for his barn to milk the cows. With two other witnesses he suddenly saw an elongated object, of a red color and brilliantly illuminated, which moved above the treetops. The cows, terrified, spread across the meadows and trembled in all their limbs. That day and the next day it was impossible to draw a drop of milk; the same effect was observed on cows belonging to neighboring farmers. Ref. : A. Michel: Flying Saucers and the Straight Line Mystery, p. 159. The two authors indicate that in Beauquay [Bauquay] in the department of Calvados on October 11, 1954, at dawn, a farmer moved towards his cattle shed to milk his cows there. With two other witnesses, he suddenly saw a large elongated object of red color, very luminous, which evolved above the top of the trees. The terrified cows dispersed through the meadows, trembling of all their members. That day and the following day it was impossible to get a drop from milk from the cattle. The same effect was observed on cows belonging to farmers of the neighborhood. The sources are indicated as "Quincy", Vallée catalogue case 236, A. Michel in "Flying Saucers and the Straight Mystery" [sic] page 159. A big, bright, red "cigar volant" zoomed over a French farmer's field at Bauquay in Normandy at sunup. The farmer, and two others, watched as the elongated object sped by at treetop level. The cows in the field went into a panic, the bells around their necks jangling loudly as the animals ran wild. A day later the cows still refused to give milk. 104. The author indicates that on October 11, 1954 at dawn close to Beauquay [sic], the Calvados, three anonymous witnesses saw a large red object evolving above the summit of the trees. The terrified cows dispersed in the meadows shaking of all their members and this same effect was observed on cows belonging to farmers of the vicinity. The source is indicated as Figuet page 149. Donald Johnson indicates that on October 11, 1954 in Bauquay, France a large red object was seen flying very fast at treetop level while cattle panicked. There were three witnesses. The source is indicated as Jacques Vallee, Passport to Magonia: A Century of Landings, p. 225. Luc Chastan indicates that in the Calvados in Bauquay on October 11, 1954 at dawn, a farmer moved towards his cattle shed to milk his cows there, and with two other witnesses he suddenly saw a large lengthened object of red color and brightly illuminated which evolved above the top of the trees. The terrified cows spread through the meadows, shaking of all their members. That day and the next day it was impossible to draw a drop of milk, and the same effect was observed on cows belonging to farmers of the vicinity. The source is indicated as "Ovni, Premier dossier complet... par Figuet M./ Ruchon J.L., Alain Lefeuvre publisher 1979. Jérôme Beau indicate that on October 11, 1954, at dawn "in Banquay [Bauquay], France, 1 large red object is seen flying very quickly at the level of the trees, while the cattle panics. 3 witnesses." Jérôme Beau indicates that the source is "Quincy". The website indicates that on October 11, 1954 at 06:00, in Bauquay, France, a "large red object was seen flying very fast at treetop level while cattle panicked. Three witnesses." The website adds that "an object was sighted that had an appearance and performance beyond the capability of known earthly aircraft. One red ball, about 10 feet across, was observed by three male witnesses on a railroad for over 60 minutes." The sources are indicated as Michel, Aime, Flying Saucers and the Straight-Line Mystery, S. G. Phillips, New York, 1958; FSR, FSR (formerly Flying Saucer Review), FSR, London, 1966; Bowen, Charles, The Humanoids: FSR Special Edition No. 1, FSR, London, 1966; Vallee, Jacques, Computerized Catalog (N = 3073); Vallee, Jacques, Challenge to Science: The UFO Enigma, Henry Regnery, Chicago, 1966; Vallee, Jacques, Preliminary Catalog (N = 500), (in JVallee01); Vallee, Jacques, A Century of Landings (N = 923), (in JVallee04), Chicago, 1969; Schoenherr, Luis, Computerized Catalog (N = 3173); Hatch, Larry, *U* computer database, Author, Redwood City, 2002. *Oct. 11, 1954 - In Bauquay, Calvados, France a large red object was seen at dawn flying very fast at treetop level while local cattle panicked. There were three witnesses. (Sources: Aime Michel, Flying Saucers and the Straight Line Mystery, p. 159; Jacques Vallee, Passport to Magonia: A Century of Landings, p. 225, case # 236). October 11 1954. Pre dawn. A farmer was walking across his field to milk a cow, when a red light illuminated the area, growing brighter. The farmer and two other people saw a huge, elongated red object, lacking a well defined shape, coming towards them just above the treetops. The cows panicked, and this farmer's one would not give milk that day. Evaluation - Looks like a bolide again, with the usual misattribution of height. It can certainly be argued that animal reactions preceding those of human witnesses are significant. But they do not demonstrate that the explanation is an extraterrestrial visit. It is in this case, it is perfectly possible that it was a meteor that passed in the sky. [---] Article in the national newspaper Le Parisien Libéré, France, October 13, 1954. [---] Article in the regional newspaper Sud-Ouest, France, October 14, 1954. [---] Article in the regional newspaper Ouest-France, France, October 14, 1954. [---] Article in the national newspaper Le Figaro, France, October 14, 1954. [---] Article in the national newspaper L'Aurore, France, October 14, 1954. [---] Article in the national newspaper Le Parisien Libéré, France, October 14, 1954. [am1] "Flying Saucers and the Straight-Line Mystery", book by Aimé Michel, S. G. Phillips publisher, USA, page 159, 1958. [jv5] "Catalogue préliminaire de 500 observations", list in "Les Phénomènes Insolites de l'Espace", book by Jacques and Janine Vallée, Table Ronde publishers, France, 1966. [am1] "A Propos des Soucoupes Volantes", book by Aimé Michel, reprint of "Mystérieux Objets Célestes", Planète publisher, France, 1967. [jv1] "Un Siècle d'Atterrissages", article by Jacques Vallée, Lumière Dans la Nuit, magazine, France, #43, 1969. [jv1] "Passport to Magonia - On Ufos, Folklore, and Parallel Worlds ", book by Jacques Vallée, Contemporary Books publisher, USA, 1969. [gc1] "The effects of UFOs on Animals, Birds, and smaller creatures - Part 3", catalogue by Gordon Creighton, in the ufology magazine Flying Saucer Review (FSR), U-K., Volume 16, #3, 1970. [ob1] "Manoeuvres Extraterrestres", article by Otto Binder, in the bimonthly ufology bulletin Les Extraterrestres, France, Series 1, #17, October 1971. [gc2] "Les effets des M.O.C. sur les animaux, oiseaux et créatures plus petites", catalogue by Gordon Creighton, in the ufology magazine Lumières Dans La Nuit (LDLN), France, #126, page 24, June / July 1973. [jv2] Summary by Jacques Vallée in "En Quête des Humanoïdes", book by Charles Bowen, French translation of "The Humanoids", J'ai Lu publisher, page 50, 1974. [am1] "Mystérieux Objets Célestes", book by Aimé Michel, Seghers publishers, France, page 218, 1976. [fr1] "OVNI, Premier Dossier Complet des Rencontres Rapprochées en France", book by Michel Figuet and Jean Louis Ruchon, Alain Lefeuvre publisher, France, pp 149-150, 1979. [lg1] "The Fifth Horseman of the Apocalypse - UFOs: A History - 1954 October", monography by Loren E. Gross, USA, page 39, 1991. 0.1 Patrick Gross April 6, 2003 First published. 1.0 Patrick Gross December 18, 2008 Conversion from HTML to XHTML Strict. First formal version. Additions [js1], [dj1], [lc1], [jb1], [ud1]. 1.3 Patrick Gross October 20, 2016 Addition [gc1]. 1.4 Patrick Gross December 21, 2016 Additions [lg1], [ub1]. 1.5 Patrick Gross April 20, 2019 Additions [ob1], [gc2], [lh1], [pr2], Summary. Explanations changed, were "Not looked for yet."